Tesla Says Vehicle in Deadly Crash Was on Autopilot - Integration Through Media ....! 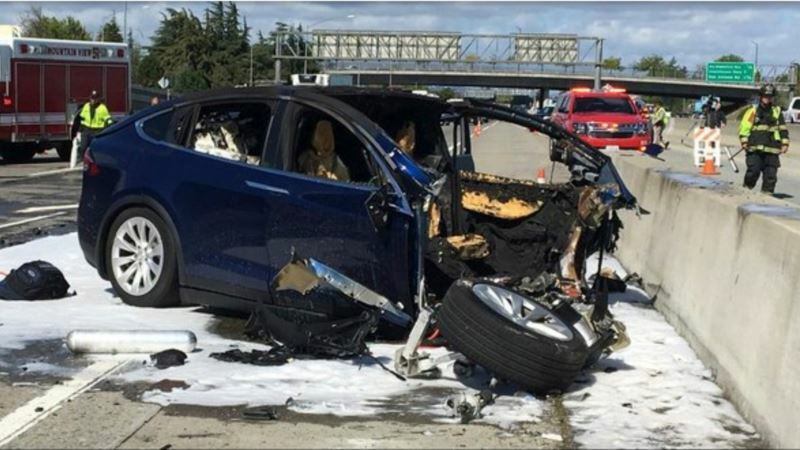 (VOA): A vehicle in a fatal crash last week in California was operating on Autopilot, making it the latest accident to involve a self-driving vehicle, Tesla has confirmed. The electric car maker said the driver, who was killed in the accident, did not have his hands on the steering wheel for six seconds before the crash, despite several warnings from the vehicle. Tesla Inc. tells drivers that its Autopilot system, which can maintain speed, change lanes and self-park, requires drivers to keep their eyes on the road and hands on the wheel in order to take control of the vehicle to avoid accidents. Tesla said its vehicle logs show the driver took no action to stop the Model X SUV from crashing into a concrete lane divider. Photographs of the SUV show that the front of the vehicle was demolished, its hood was ripped off and its front wheels were scattered on the freeway. The vehicle also caught fire, though Tesla said no one was in the vehicle when that happened. The company said the crash was made worse by a missing or damaged safety shield on the end of the freeway barrier that is supposed to reduce the impact into the concrete lane divider. The crash happened in Mountain View, in California's Silicon Valley. The driver was Walter Huang, 38, a software engineer for Apple. "None of this changes how devastating an event like this is or how much we feel for our customer's family and friends,'' Tesla said on its website late Friday. Earlier this month, a self-driving Volvo SUV being tested by ride-hailing service Uber struck and killed a pedestrian in Arizona. Tesla Inc. defended its Autopilot feature, saying that while it doesn't prevent all accidents, it makes them less likely to occur than is the case for vehicles without it. Federal investigators are looking into last week's crash, as well a separate crash in January of a Tesla Model S that may have been operating under the Autopilot system.